Cystic fibrosis is a systemic disease caused by autosomal recessive inheritance of defective genes that encode the cystic fibrosis transmembrane conductance regulator. Cystic fibrosis is systemic, but its hallmark is poor pulmonary mucociliary clearance leading to mucous impaction and chronic lung inflammation and infection. Because of defective airway host defenses inherent in the disease, the lung microenvironment creates an inviting milieu for infection with non-tuberculous mycobacterium. Identification and treatment is difficult because of the multitude of bacterial pathogens cystic fibrosis patients may harbor. Diagnosis is centered around excluding other causes of infection, identifying symptoms of non-tuberculous mycobacterial disease, recognizing related imaging findings, and recovering non-tuberculous mycobacterium microbiologic specimens. Treatment is complex, prolonged, and hindered by side effects of treatment medications. 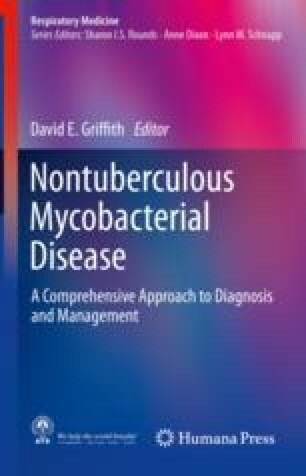 In this chapter we discuss the facets on non-tuberculous mycobacterial disease unique to the cystic fibrosis patient.